It's almost 1,600 miles from Broome to Darwin. 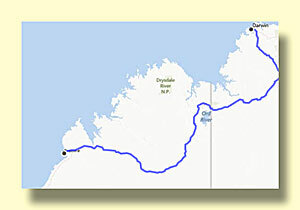 Much of the route is even more empty than the emptiest of sections between Perth and Broome. 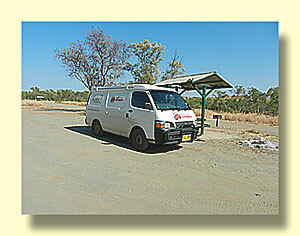 Fuel stops are often just a roadhouse and, although there are some formal campgrounds, the rest stops are very popular for overnighting. This section has many baobob trees along the highway. 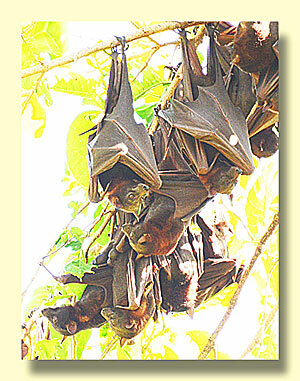 These are usually thought of as African trees, but Australia has them too. 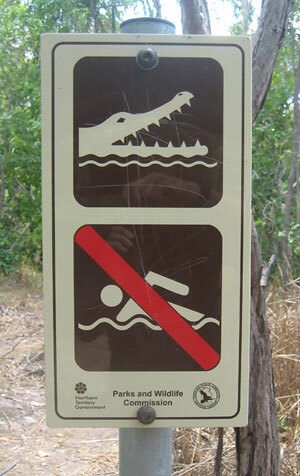 Salt water crocadiles are dangerous, and they're pretty common in northern Australia. It's best to think twice before getting too close to the water in this area. 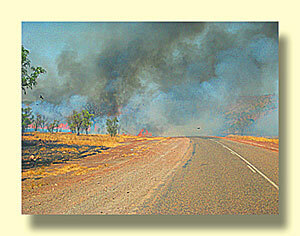 The Australian bush has lots of fires. 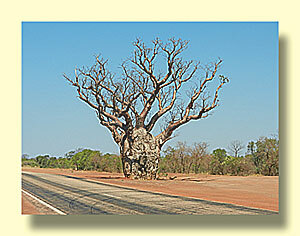 Traditionally these were set by aborigines because the burnt-over areas provided more food as they recovered. While this in no longer part of the lifestyle, this is a very dry area and fires continue to be common. As we moved along this week we encoutered fires along the road and three nights in a row stayed at campgrounds with day-old burnt areas or active fires directly adjacent to the camping area. We had to stop and wait a while for this fire. Large numbers of black kites hovered over the road feasting on insects fleeing ahead of the flames. It didn't take much time for it to burn up the available fuel on the left side of the road and retreat. Once it did we continued on. We were the only witnesses, there was no other traffic. We spent one night at this small farm, tourist resort, and caravan park. For us the attraction was the local birds. 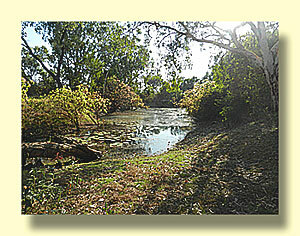 A billabong (small lake) runs throught the farm and attracts many of then. Unfortunately, when we visited the birds were scarce. 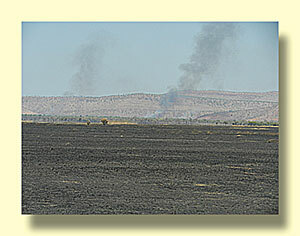 A brush fire was approaching and by nightfall was right up to the edge of the property. The owners had little time for guests as they continued what had been three days of battle as they tried to save the farm from the fire. Late in the evening the wind changed and they were able to start a backfire. That should save the place - until next year. 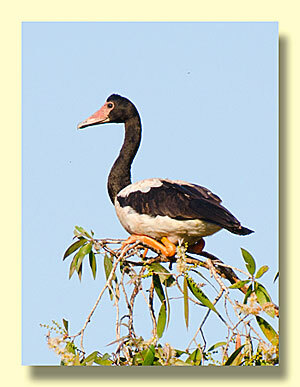 Twenty feet above the ground this Magpie Goose isn't worried about the fires, or the crocs either. 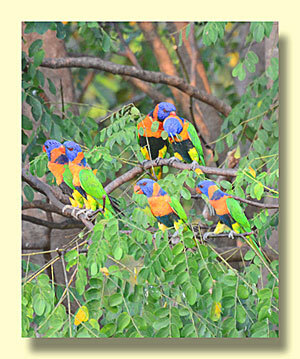 One of the birds everyone want to see in northern Australia is the Gouldian Finch. We did our research, and it is reported that finches are commonly seen near the swimming pool at the Lake Argyle Resort and Caravan Park. Seemed like a good reason to visit. Unfortunatly for us, this park too had a fire the day before we arrived, and the finches were nowhere to be found. 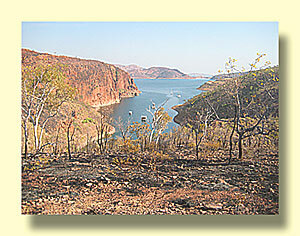 Note the burnt landscape in the foreground. 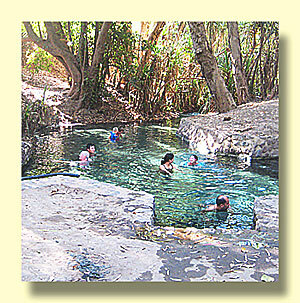 This is just below the campground. Great views - but no finches! 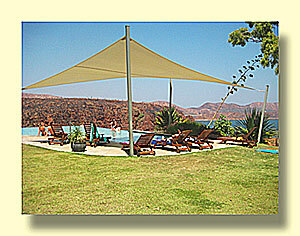 Lake Argyle Resort and Caravan Park website. Katherine sits at the junction where the Victoria Highway from Broome meeds the main north-south highway through central Australia, the Stuart Highway. Darwin is only 200 miles to the north. 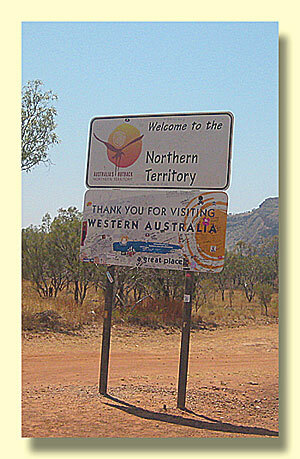 It's a really pleasant town with nice caravan parks and the Niitmiluk (formerly Katherine Gorge) National Park just to the east. 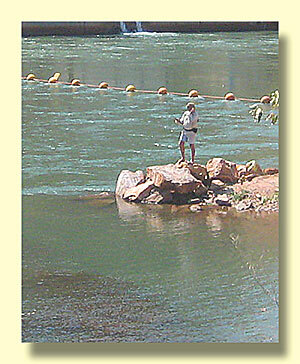 It was a good place to stock up before heading north to Litchfield National Park. 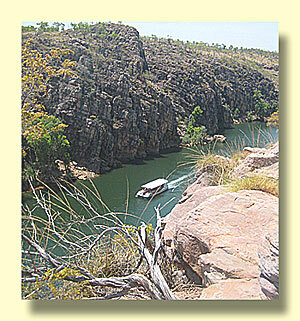 More about the Nitmiluk National Park. 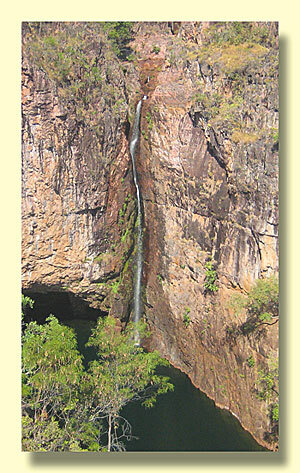 We had two reason to visit Litchfield National Park. 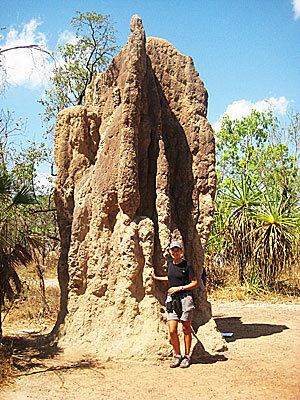 First, it's a great park with waterfalls, swimming holes, and famous termite mounds. And second, just outside the park is Batchelor Resort Caravillage where the owner feeds hundreds of birds every evening. 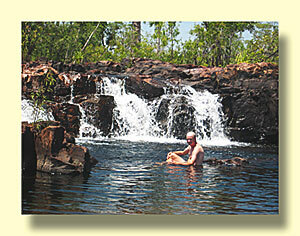 More about Litchfield National Park. 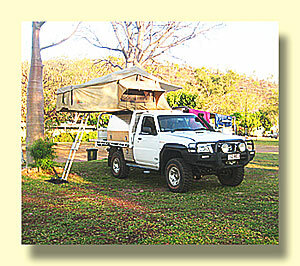 Australians like tents, here's one on top of a truck. Note that this is one of those trucks that we talked about last week that has a tray instead of a pickup bed. Note also the black snorkel on the left front pillar of the cab. Look close, it's hard to see in this shot. 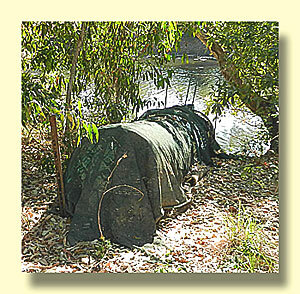 These are common and useful in Australia because roads are often flooded during the wet season.